The main goal of an anonymous survey is to get true and honest responses. However, your participants will most probably not be able to verify that your survey is indeed anonymous and doubts regarding anonymity often lead to dishonest responses and skewed data. This is why we offer an “Anonymous Survey” option that you can enable for each individual survey. 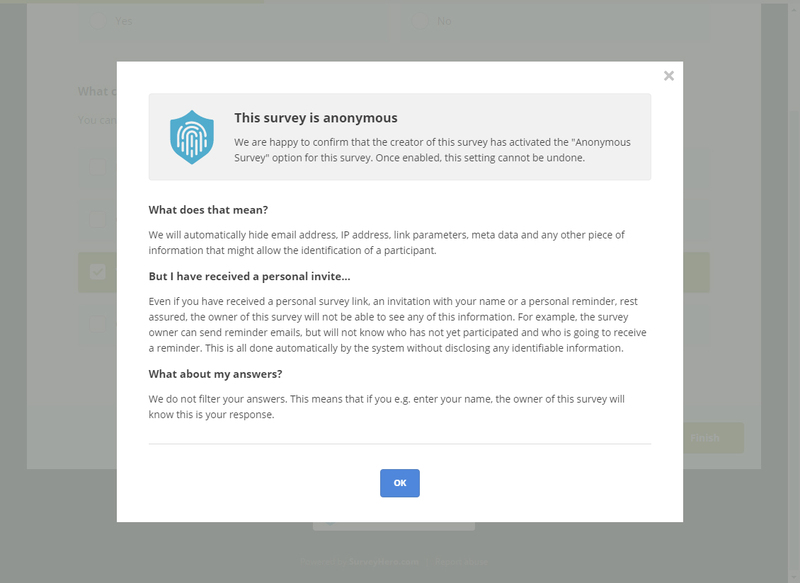 Once activated, we will hide any data that might allow you to identify your participants (making your survey truly anonymous) and most importantly, we will officially label your questionnaire as anonymous. That way, we will confirm to your participants that your survey is indeed anonymous and that they can answer it truthfully. 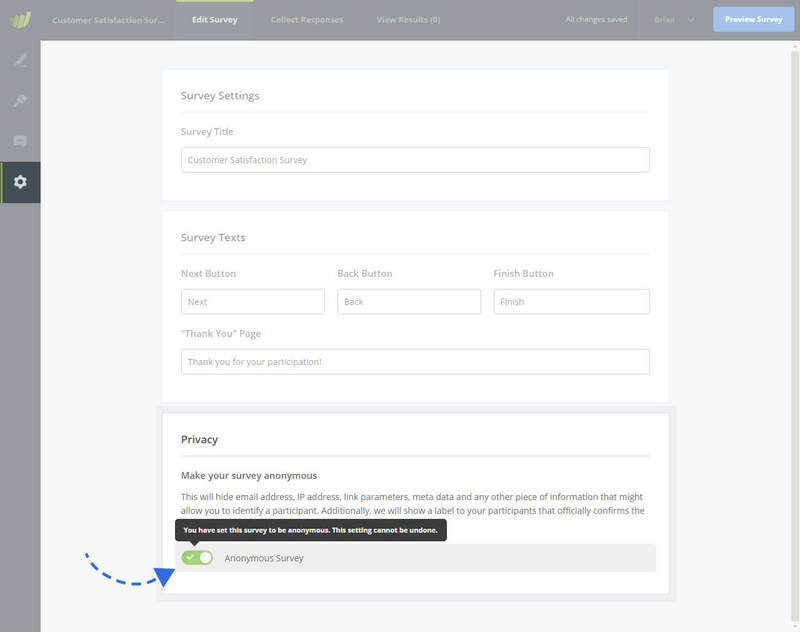 To make your survey truly anonymous, you must activate the “Anonymous Survey” option in your survey settings. To add one more level of protection, this setting cannot be deactivated once it has been turned on. Once active, this setting cannot be deactivated again! 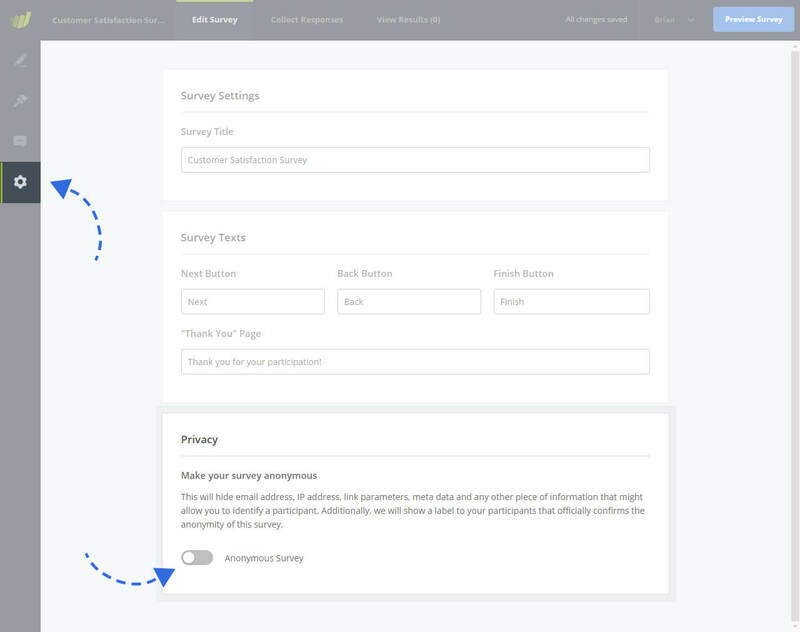 What happens once the Anonymous Survey setting is active? 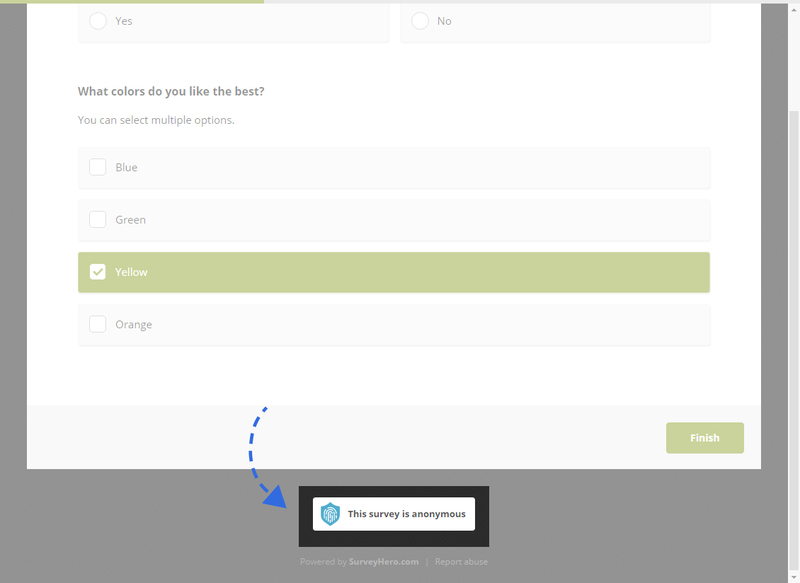 Once enabled, we will show a label to your participants that officially confirms the anonymity of the survey. They will be able to click on the label and find out more information about how their identity is protected. What is being done to make the survey anonymous? IP addresses will be hidden in all results. Any GET parameter that you might have added to your survey links will be hidden in your results. Meta data of your participant’s browsers will also be hidden in your results. While you can still create and use multiple collectors to invite your participants, we will hide the collector name in the results. This also means that you will not be able to filter your results by collector name anymore. You will still be able to invite your participants by email with our Email Invite collector, however, we will hide the participation status for each email address (so you do not know who has participated yet). Additionally, when sending a reminder, you will not see who will receive a reminder message. You will only see the number of recipients that will be reminded. Even though we are doing everything we can to make your survey responses as anonymous as possible, there are some things you need to look out for. We do not filter the actual answers of your participants. This means that if you have questions in your survey which ask for personal information, e.g. “Enter your name”, then of course you will know the identity of your participants.